Sometimes experimentation is a must in your work and life..sometimes it works sometimes it doesn't! I think this photographic experiment worked, I like the resulting image! 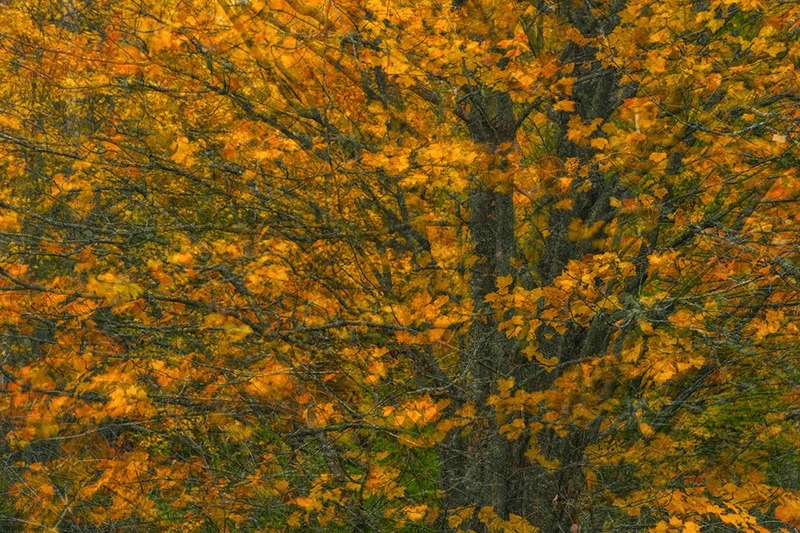 On my recent road trip to see and capture the beautiful fall foliage of the Northeast I experimented with this beautiful tree as a subject. I have always loved impressionism and have made more than my share of 'swipes' and in camera 'multiple exposures' in the traditional way. I have also made layered images adjusting opacity and brushing in and out sections of an image where I wanted to keep or remove parts of an image to arrive at a unique image, but I had not come up with this method before. I am sure someone has, that I don't know about, but I thought it was interesting. I liked the result and thought I would share it here. This image creating technique is something I will add to my shooting repertoire in the future when the subject has potential. I chose the original composition carefully watching the background as I did not want any "white" holes but instead a full texture of vegetation. Then I made five separate shots keeping the camera position the same on a rock steady tripod. Each image was captured in a different file. The wind was briskly blowing and I chose a small aperture f-22 which gave me a 1.3 second exposure at ISO 100 for each shot. At that shutter speed with the wind blowing each shot was different as the leaves were fluttering and the branches moving with the trunk of the tree fairly steady. I then opened all the images in Photoshop created layers for each one and adjusted opacity, blend modes and masked sections in each layer to get to the final image here. It is a five layer composite, creating a slightly different look than moving the camera for each exposure as in a multiple or a single swipe impression. Would love to hear your thoughts on this image. I have always loved poetry and find this one from Carl Sandburg fits my image, the season and the idea of change and impermanence. Hope to see you at Nature Visions Photography Expo in Virginia November 15-16 where I will be sharing two presentations, one on iPhone Photography and the other on Travel Photography...for more info and registration click here.